Last year, we started the tradition of Christmas pictures with Santa. 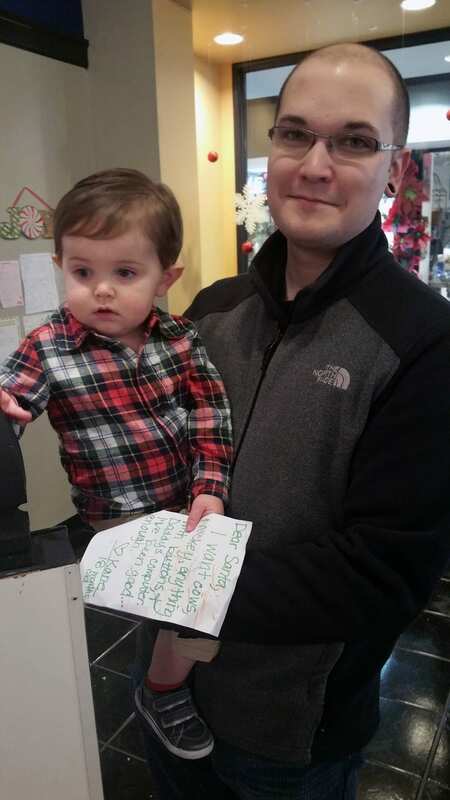 Now, not all Santa picture experiences are created equal, and we were going for the experience (yes, I realize Kane was only 6 months old at Christmas last year, but you’re missing the point). After reading some posts on Facebook, we decided to take Kane to visit Santa at Lexington Green. We had a wonderful time–the photographer was patient, the atmosphere was fun, Santa looked real, and it was an all-around great experience. So of course we went back this year (and Easter in-between)! 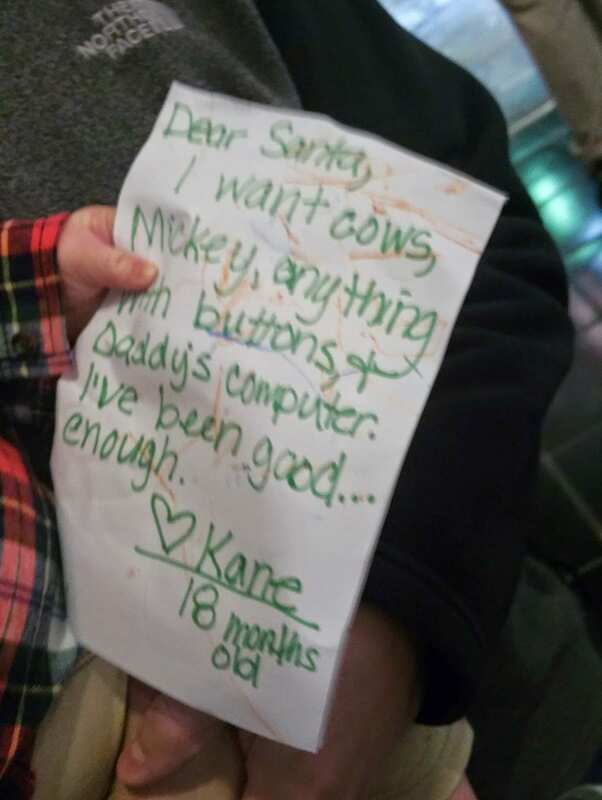 Before we went, I helped Kane write his letter to Santa. I was really excited to take it with us because they post the letters up on the wall, and you can read them as you wait in line. Lexington Green actually offers you the opportunity to make an appointment with Santa, so we chose that option this year and skipped the line. I was trying to make the experience as easily as possible. There was a lady taking a pic with her dogs when we got there, and Kane seemed to not only like the dogs but be interested in Santa as well. . .
Once we looked at the pics the photographer managed to snap, this was about the best one, so we had them crop it down to just show Kane and Santa. Which is when I noticed Kane’s fist. 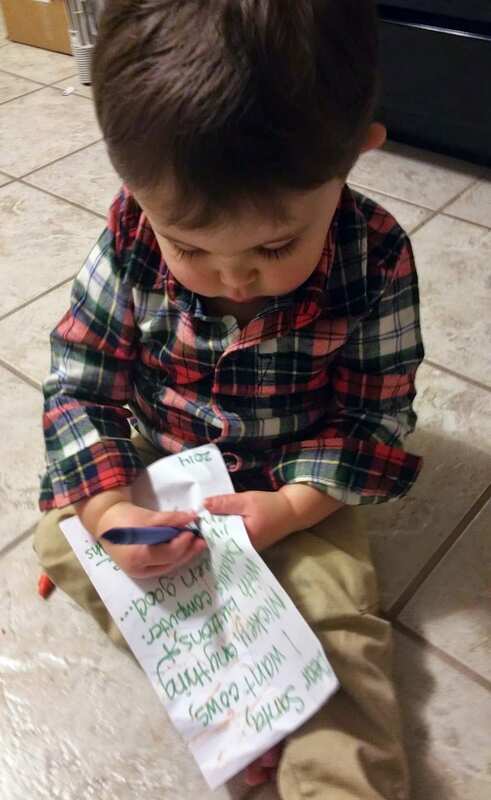 Only my child. 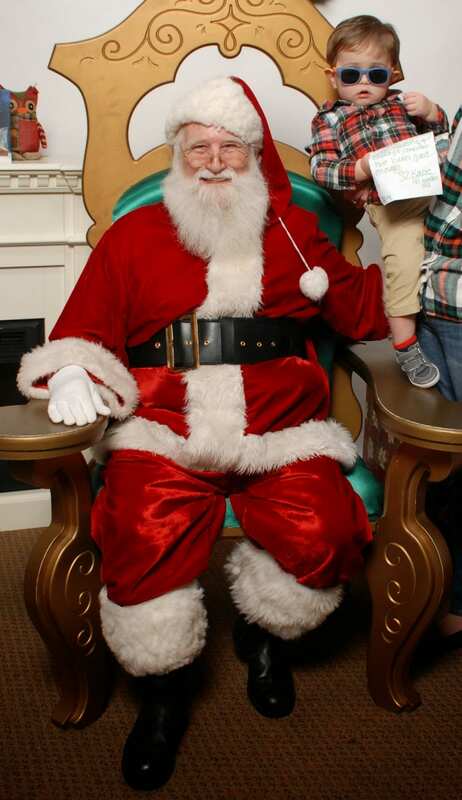 So, as the mother of an 18 month old who survived pictures with Santa, here’s some advice. I hope it makes your experience less stressful. 1. Don’t go in with expectations. Yes, we all have that Pinterest-perfect imagine in our mind of the perfect picture with Santa, but be aware that it’s probably not going to happen. 2. Dress to match because you just might end up in the picture yourself. 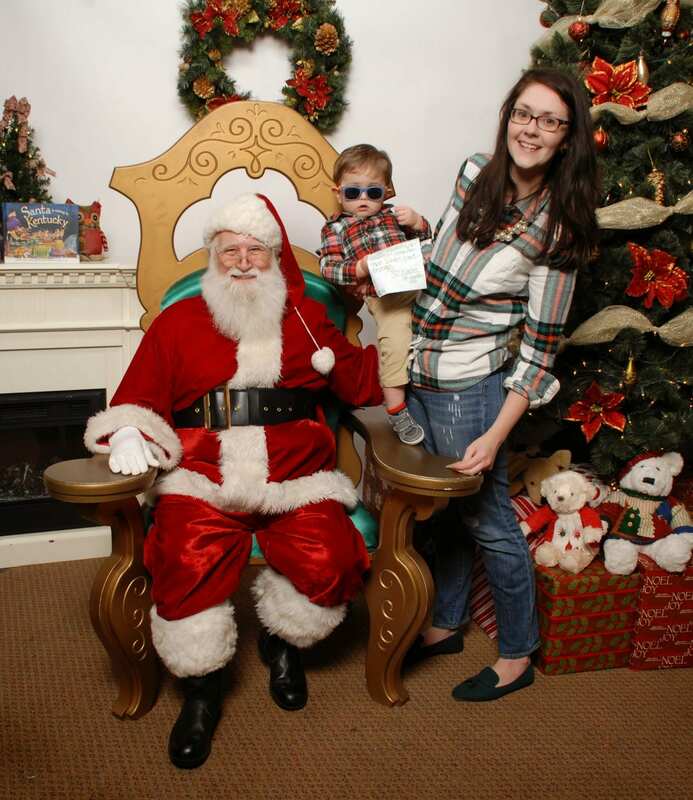 The only way we were getting a picture with Santa this year was for me to be in it as well. Thankfully, our plaids matched close-enough. They offered to let us take a family picture in lieu of a picture with Santa, but we were not dressed for that either. I wish I would have thought of that in advance. 3. Timing is everything. This means get in nap time and meal time before you go, and take bribe snacks with you as well. Try to make an appointment or go when the crowds aren’t so bad, which will reduce the stress-level overall. 4. Make it fun. We started the sunglasses with Kane’s Easter Bunny pics earlier this year, and they just made the photo hilarious. So we decided to pop them on him again for Santa. Try something a little bit different to set your photo apart, but just don’t force it on the kids. If they don’t want to do it, then you’ll only make the situation worse by forcing it. Any other advice for Santa pictures? Or funny stories about your Santa pictures? Be sure to share in the comments below!!! Santa at Lexington Green was nice enough to send me the digital version of this photo to use on the blog for free, but all opinions are my own. Be sure to check them out if you’re in the Lexington area!!! I love love love this picture. It cracks me up every time I see it. Mr. Kane is something else. I love him! We started the sunglasses with the Easter bunny, and they were too cute, so we decided to keep it up! Are you going to try again with Juliet?? ?